Xoan singing was originated in several localities in Phu Tho Province, including guilds of Phu Duc, Kim Doi, Thet (Kim Duc Commune) and An Thai (Phuong Lau Commune), Viet Tri City. There are three forms of Xoan singing as the worship singing to commemorate Hung Kings and village guardian gods; the ritual singing to pray for good crops, good health; and the festive singing – a form of love duet. Often practiced in spring, Xoan singing is a combination of poetry, music, singing, dancing. There exists tight attachment between poem and rhythm, the meaning of poem unites with music. Xoan singing has three types: recital melody (hat noi); chanting melody (hat ngam ngoi) and praising melody (hat xuong). 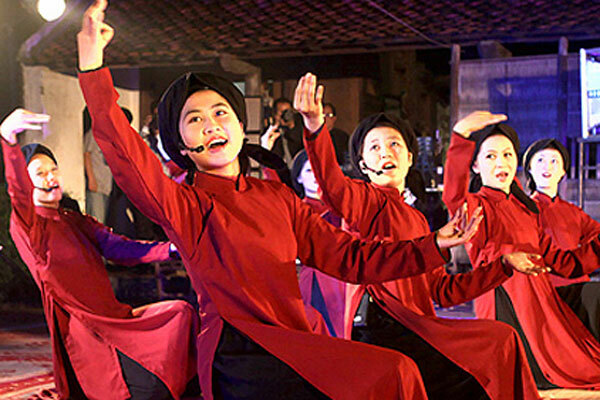 Xoan singing is organized into Xoan guilds, each including 15-18 people, of which are 2-9 male instrumentalists called kep, and 6-12 female singers called dao. Each guild is headed by an old man who has a thorough knowledge of Xoan singing, referred to as Trum. A performance of Xoan singing normally comprise of three phrases: Worship singing, Ritual singing (or qua cach singing) and Festive singing. Props of Xoan guilds include little bottles of wine, paper fans and a book of 14 qua cach (folk melodies) written in Nom script. Instruments include a small drum, a big drum and a few pairs of clappers. On November 24th 2011, at the 6th meeting of the Inter-governmental Committee for the Safeguarding of the Intangible Cultural Heritage of UNESCO held in Bali, Indonesia, Xoan singing in Phu Tho was officially recognized as Intangible Cultural Heritage in Need of Urgent Safeguarding.